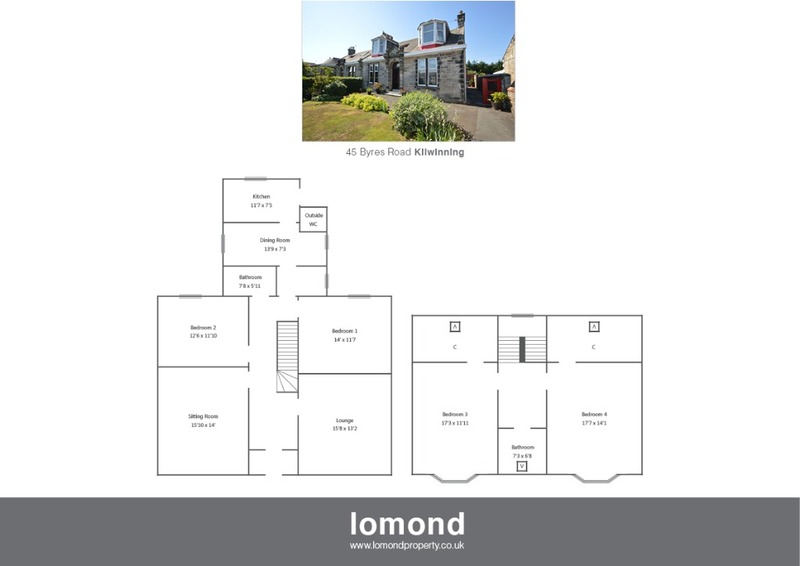 45 Byres Road is a substantial semi detached villa offering excellent family sized accommodation over two levels. The property comprises of seven principle apartments, two bathrooms, with generous garden grounds to both the front and rear. The property is situated just a short walk from the town centre and train station which provides excellent rail links to Glasgow and Ayr. In summary the property layout extends to an entrance vestibule leading to a spacious hallway with stairs rising to the upper level. The ground floor accommodation is generous throughout, comprising of a large front facing lounge with traditionally high ceilings, and large sash window. Also to the front is a further sitting room, with feature fireplace and original cornicing. There are two bedrooms on the ground floor, both double in size. To the rear there is a dining room with kitchen off. A family bathroom completes the ground floor. The upper level houses two bedrooms, both of which are doubles, and a further family bathroom. Off each of the bedrooms are two further room, which could easily be utilised as further bedrooms, or en suite bathrooms. Externally the property has garden grounds to the front and rear. To the front the grounds are laid predominantly to lawn with mature shrubs. To the rear the garden is large laid to lawn with patio area. There are a number of outside building/storage units. The property benefits further from a garage situated across the road. Byres Road is a residential area. Kilwinning town is close by and provides access to a range of amenities including supermarkets, bars, restaurants and town centre shopping. There are a number of local primary and secondary schools within the greater Kilwining area.